From now until Father’s Day (June 19), Samsung is offering a free Samsung Gear VR headset (worth $99) with the purchase of a qualifying phone. If you haven’t tried it, Samsung Gear VR is a headset that provides a true virtual reality experience, beyond what any Google Cardboard viewer is capable of. HERE is an explanation of why it’s way better than Google Cardboard. Even if they don’t care about 360 or any of the dozens of games, a Gear VR will let them watch Netflix or Hulu, or surf the internet with their own private giant screen in their very own virtual cinema theater (yes you can watch your own videos too). 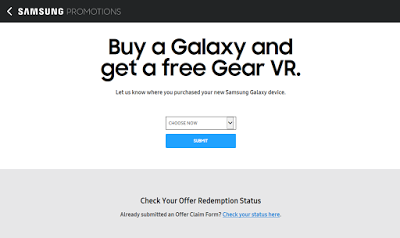 Once you purchase the phone, go to this Samsung site on or before June 30 to request your free Gear VR. Allow 6 to 8 weeks to receive your Gear VR. Once you get the Gear VR, here’s how to set it up.